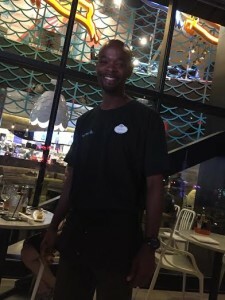 Last week I had the luck to get into Cowfish restaurant at Universal’s Citywalk. My original plan was to eat at Margaritaville which is an old standby for me; fun with good if not touristy food. Lucky for me, the wait was quite extensive and my impatient and hungry companions decided to try to walk up to Cowfish instead. This restaurant is fairly new and it is a unique and welcomed concept. 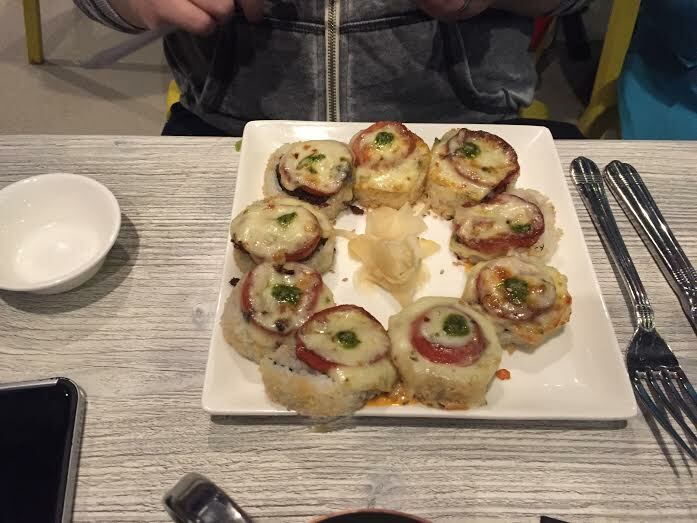 They speicalize in two things; burgers and sushi. These happen to both be very trendy and popular food items so the concept works well. The fact the they successfully marry the two items is just icing on the cake! We were seated on the outdoor deck which proved to be a great place to sit as we got great views of the fireworks towards the end of our meal. It was a nice night and the outdoor temps were perfect for dining. First and foremost I must mention our waiter. If you can request Terrell to wait on you, you will not be disapointed. Five stars, two thumbs way up, and all of that jazz. This guy was so fun and really took the time to make sure our experience was fantastic. A good waiter can make or break a meal and this guy made it! I never saw him once without a smile on his face. Very cool! 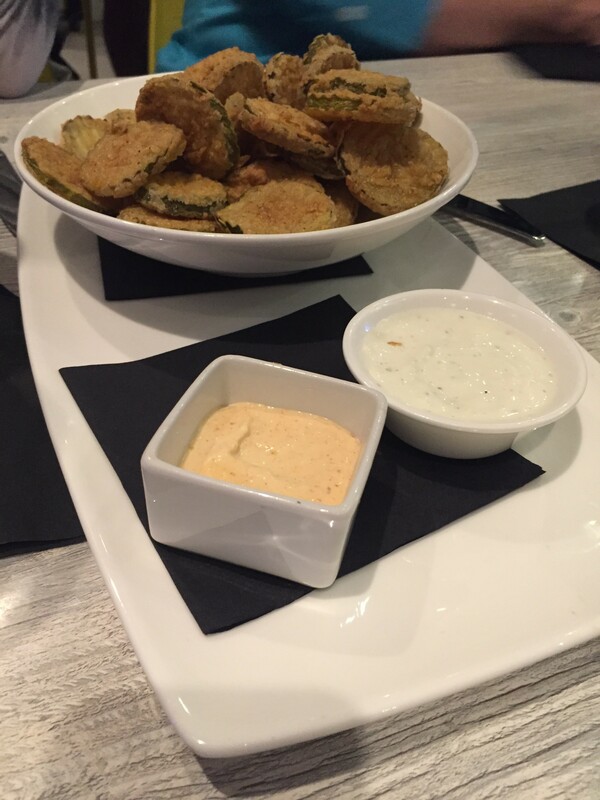 We started off with the fried pickles. These come with a choice of ranch and horseradish aioli sauce for dipping. Honestly, you could dip these in just about anything and they would still be amazing, but the horseradish sauce was my favorite. The only problem with these is that simply they give you too many! There were three of us and though we had no issue finishing the bowl of pickles, we probably should not have had them as we all filled up way too quickly! For my entree I selected the Apple, Berry and Brie Turkey Burger on my waiters suggestion when I was torn on what to get. This burger is so good and so unique. The flavors all work so well and the honey mustard is just tangy enough to hold it all together. A real winner in my book! The best part was I ordered the side of veggies instead of fries which was very welcome after filling up on all those pickles. 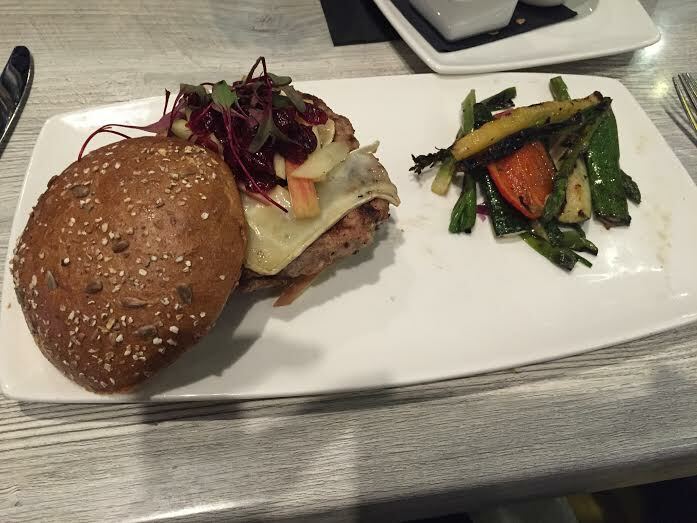 The veggies had a very light flavor that balanced out the burger. My sister chose the taste explosion which is what Cowfish calls Burgushi…a combination of a burger and sushi. This dish features angus beef, jalapenos, spicy mayo, bacon, tomato and pepperjack cheese. My sister raved about this dish. It is fun and creative! My mother made the wisest choice of all in her dinner pick. 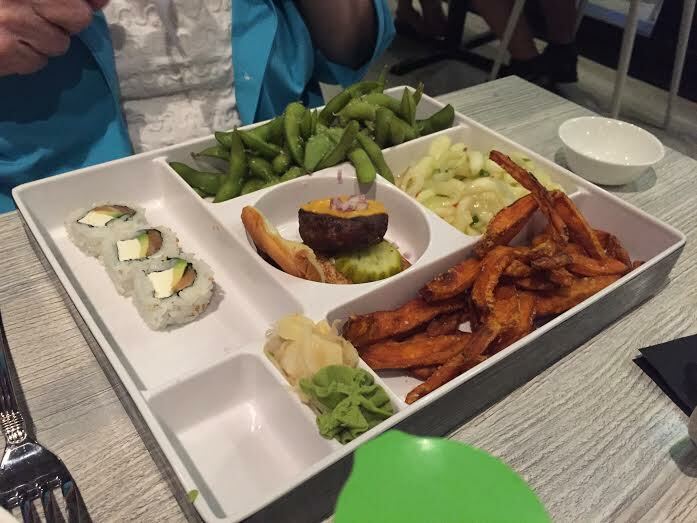 She chose the cowfish bento box which features a cheesburger slider, sushi, sweet potato fries, edamame, and thai cucumbers. It is really a sampler of all the great things they provide! She was very pleased with her selection. Please, if you are visiting Universal, do yourself a favor and get a reservation at Cowfish. I was lucky to walk in, but I know when the summer crowds hit this is going to be a tough table to secure! This entry was posted in Planning Tips, Restaurant Spotlight, Review, Universal Orlando and tagged burgers, Citywalk, Cowfish, Dining and Restaurants, sushi, universal Orlando. Bookmark the permalink.